Your clothes and shoes could soon be made from seaweed. That’s if AlgiKnit, a biomaterials research group based in New York, has anything to do with it. AlgiKnit is devoted to developing wearable textiles from readily abundant biopolymers. Fashion is the world’s second most polluting industry, says fashion design graduate Aleksandra Gosiewski, who’s a co-founder of AlgiKnit and speaker at Design Indaba 2018. 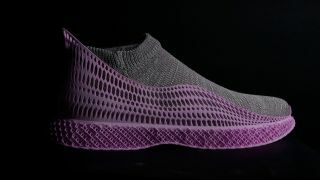 In fact, they’ve done more than make a bioyarn: they’ve also made a shoe. Introducing AlgiKicks – a revolutionary sustainable sneaker that rapidly degrades after the product has finished its useful lifetime. AlgiKnit’s bioyarn project was initially part of an entry for the Biodesign Challenge, a competition that invites art and design students to envision future applications of biotechnology. Gosiewski’s team won the competition, and the group decided to continue their research under the name AlgiKnit.